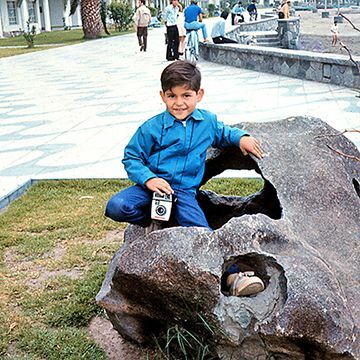 When I was eight years old, my dad gave me my first camera. It was a little basic plastic 126 mm. and it was my most prized possession. Although my dad worked in the camera industry, photography was very much his passion and he had a really good eye for taking photos. Over the years, he taught me everything he knew, including several techniques, which I still use today. In the 1980s, I studied at the Brooks Institute of Photography in Santa Barbara, California. From there, I transitioned into the real world, and the role of photo assistant for a handful of the best portrait, fashion, and advertising photographers in the bustling Los Angeles scene. I worked long days, lifted countless sandbags, stands, booms and gear, all the while soaking in as much experience and information as possible. I learned so much working day in and out with those photographers; I also ended up with an endless supply of Sharpies on my desk—an unavoidable side effect of coming up during the days of film. Learning and honing my craft from a traditional film perspective has given me a deep and fundamental understanding of light and composition, which still instructs my work today. Over the past 25 years working as a professional photographer, I have created my own body of work, with an emphasis on catalog, advertising portraiture, and sports. Along the way, I’ve been lucky enough to collaborate with a wide-range of clients including: Kodak, Nike, Asics, Casio, AT&T, British Petroleum, Red Bull, Vaio Computers, Oakley, Northrop Grumman, Sears, Nemo Designs, Target, Vitro Advertising, Men’s Health, Quiksilver/Roxy, Billabong, Kaenon Sunglasses, and more.